Background : Japan has a large number of senior citizens. Yoga can be wisely applied in old age care. There is no any age restriction to practice yoga. The effect may differ by age. There is a need to study the mechanism of action of yoga with respect to age. Aim: This study was conducted in Japan to find the effect of yoga on mental health between young and senior people. 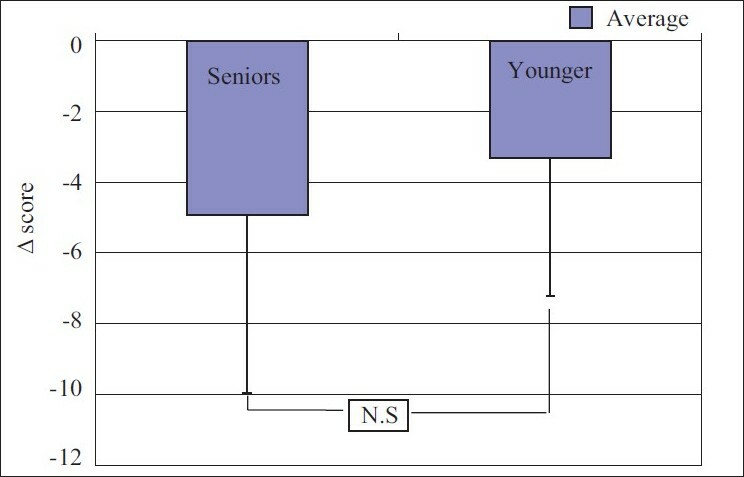 Materials and Methods: Twenty-five normal healthy volunteers of both sexes were divided into two groups according to age. Fifteen participants of the age group between 65 to 75 years and 10 participants of the age group between 20 to 30 years were selected. This study was approved by the ethical committee of Kawasaki University of Medical Welfare. Selected individuals were subjected to 90 min of yoga classes once or twice a week for a month. Salivary amylase activity was assessed before and after yoga practice. State Trait Anxiety Inventory (STAI) was given before yoga on the first day and after one month of practice to assess the change in State anxiety and Trait anxiety. Results : Senior group - Salivary amylase activity decreased from 111.2±42.7 to 83.48±39.5 kU/L [average±standard deviation]. Younger group - Salivary amylase activity reduced from 60.74±31.8 to 42.39±24 kU/L. Senior group - State anxiety score decreased from 41.13 ±8.43 to 30.8±6.49, Trait anxiety score reduced from 45.66±7.5 to 40.73±8.3. Younger group - State anxiety score reduced from 38.7±4.8 to 30.8±4.1,Trait anxiety score reduced from 46.2±7.9 to 42.9±9.1. Changes were statistically significant with P<0.05. Conclusion: Decrease in Salivary amylase activity may be due to reduction in sympathetic response. Reduction in State and Trait anxiety score signifies that yoga has both immediate as well as long-term effect on anxiety reduction. Thus yoga helps to improve the mental health in both the groups. Japan is a country with a large number of senior citizens. In the year 2000, the population of people aged above 65 years was 17.3% and in 2009 it has reached 22%. Cancer and heart diseases are the two major causes of death in Japan. Dementia, stress, degenerative joint diseases and respiratory infections are the most common health problems affecting the elderly population. Daycare centers and old age homes are working hard to improve the quality of life of the aged. Different methods are being adopted to improve their lifestyle and keep them active. Music therapy, animal therapy, massage and stretch exercises are among them. Yoga is an ancient Indian science which helps to improve physical, mental, social and spiritual health. Yoga has found its special existence in Japan by its peculiarities like asana and pranayama. But many consider yoga as an alternate to exercise. Few research works have been conducted in Japan on yoga. There is a need to show that yoga is not merely an exercise system but it has many more health benefits. It can be wisely applied in the old age care to improve the quality of life. Research is needed to understand the mechanism of action of yoga. Age is an important factor to be considered while studying the physiological changes. Even though there is no age restriction to practice yoga the effect may differ by age. There is a need to study the effect of yoga with respect to age. Assessment of salivary alpha amylase (sAA) activity is a newly developing, noninvasive, simple method to assess the acute sympathetic response or stress. No study has been conducted in Japan on the effect of yoga on sAA. The aim of this study is to compare the effect of yoga on mental health between young and senior subjects in Japan. In this study 25 normal healthy volunteers of both sexes, interested in yoga were selected. They were divided into two groups according to age. First group with 15 participants of age group between 65 to 75 years and a second group of 10 individuals between the age group of 20 to 30 years were selected. Informed written consent was taken from all the participants. This study was approved by the ethical committee of Kawasaki University of Medical Welfare, Kurashiki, Okayama prefecture, Japan. It is a comparative study between the young and senior subjects to assess the effect of yoga on mental health. Fifteen seniors and 10 young participants were assessed before and after yoga practice. Pada uttanasana - Eka and Dwipada. Shalabhasana - Eka and Dwipada. At the end of asana session, they were advised to practice Shavasana for 5 min. Bhramari -3 rounds, followed by 'OM' meditation for 15 min. 1. Salivary amylase activity was assessed before and after yoga practice once or twice a week for a month. Salivary amylase activity monitor or Cocorometer of Nipro Corporation, Osaka, Japan was used to measure salivary amylase activity. The measurement system consists of a disposable test strip and the main unit of the measuring instrument. The test strip consists of the collection sheet in which the saliva collection paper is installed and the test paper holder. The test paper is affixed to the back side of the test paper holder. The saliva transcript mechanism and the optical measuring unit to measure the color density of the reagent are installed in the main section of the measuring instrument. Obtained data was analyzed statistically using paired t test to test the significance within the group, and compared between the groups using unpaired t test to assess the difference between the groups. SPSS program and Microsoft Excel 2003 were used to perform statistical analysis. Level of significance was set at P<0.05. In senior group, out of 15 participants, 11 were females and four were males. In the 10 young participants, seven were females and three were males. In the senior group, five members were taking medicine for hypertension and it was under control. Salivary amylase activity in the senior group - It decreased from111.2±42.7 to 83.48±39.5 kU/L [average±standard deviation]. The change which occurred after yoga practice was statistically significant. 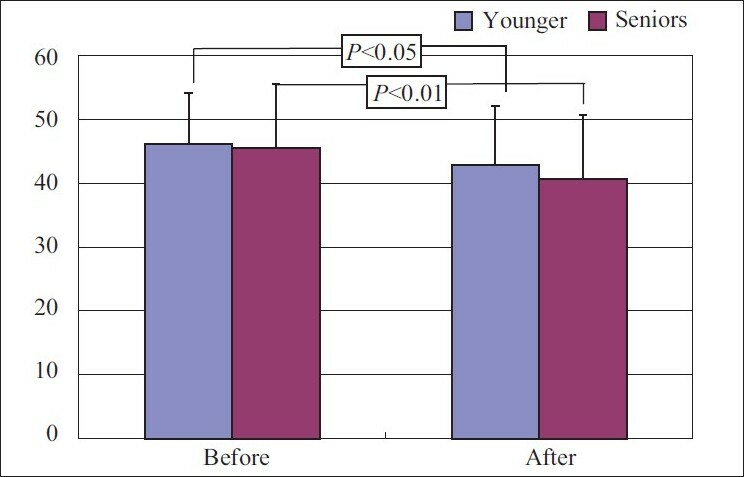 Salivary amylase activity in the younger group - It also reduced after yoga practice from 60.74±31.8 to 42.39±24 kU/L with P<0.05, a statistically significant change. When both the groups were compared to assess any difference in effect between the groups, it showed insignificant difference with P>0.05 [Figure 1] and [Figure 2]. Score decreased from 41.13±8.43 to 30.8±6.49, P<0.05 a statistically significant change. Score for general feelings reduced from 45.66±7.5 to 40.73±8.3 with P<0.05, a statistically significant decrease. When the change in state anxiety was compared with that of trait anxiety the difference was significant. The response was more for state anxiety. Score decreased from 38.7±4.8 to 30.8±4.1. The change which occurred after yoga practice in present feeling was statistically significant. The score reduced from 46.2±7.9 to 42.9±9.1 with P<0.05, a significant change was observed [Figure 3] and [Figure 4]. When the change in state anxiety was compared with that of trait anxiety the difference was significant. Response was more for state anxiety compared to trait anxiety. 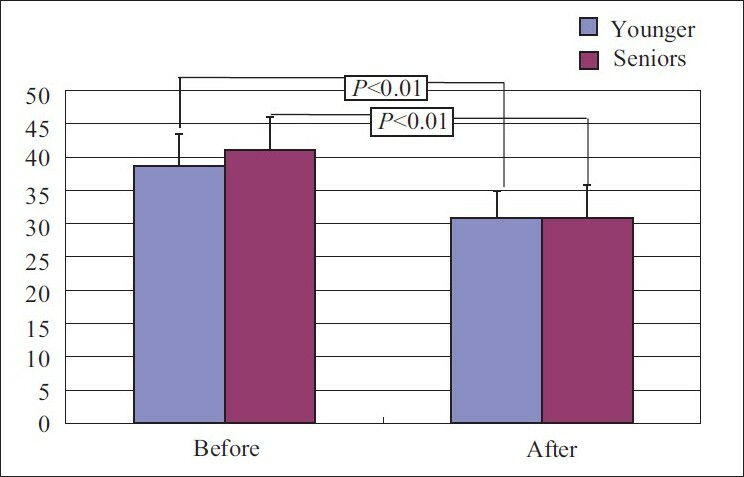 When compared between the groups for any difference in response for state anxiety and trait anxiety, the result was not significant [Figure 5] and [Figure 6]. Salivary amylase activity is one of the simplest methods to assess the sympathetic activity. Alpha amylase is one of the major protein components of saliva. Sympathetic stimulation increases the salivary protein secretion and parasympathetic stimulation increases the salivary flow rate. It has been studied that stress-induced increase in salivary amylase is independent of salivary flow rate. Decrease in sAA is due to reduced sympathetic stimulation. Reports are available about physical (exercise) and psychological stress increasing the alpha amylase level. It has been observed that stress induced increase of sAA and nor epinephrine levels are positively associated. Normal value for sAAis not yet determined. Many factors will influence its activity  such as effect of time of day; values are lowest in the morning and reach highest levels in the evening. Gender - salivary amylase levels have not been shown to differ according to gender. Food - stimulation from smelling, tasting and ingesting food increases sAA. Age-Basal levels appear to remain stable over adult years, but it is not clear how they change in old age. Considering these points in this study, the time of yoga practice was fixed in the morning, about 90 min after taking food. 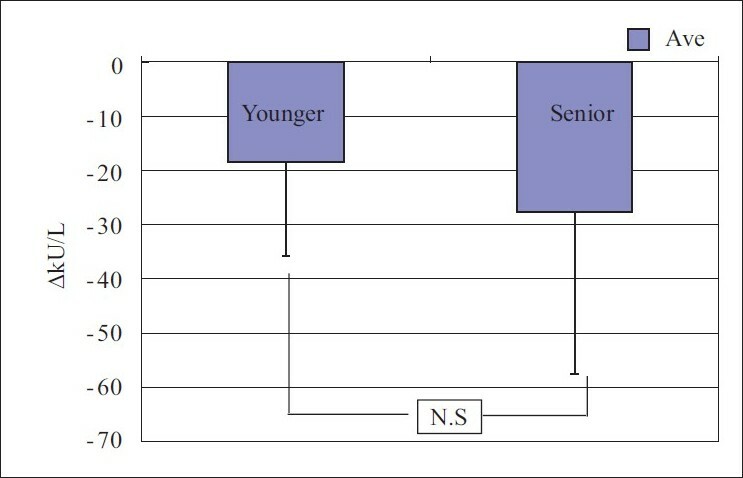 As it is a comparative study the subjects were divided into two groups according to age to minimize the influence of the age factor. In this study sAA level decreased after yoga practice in both the groups. When compared between the groups there was no difference in effect. 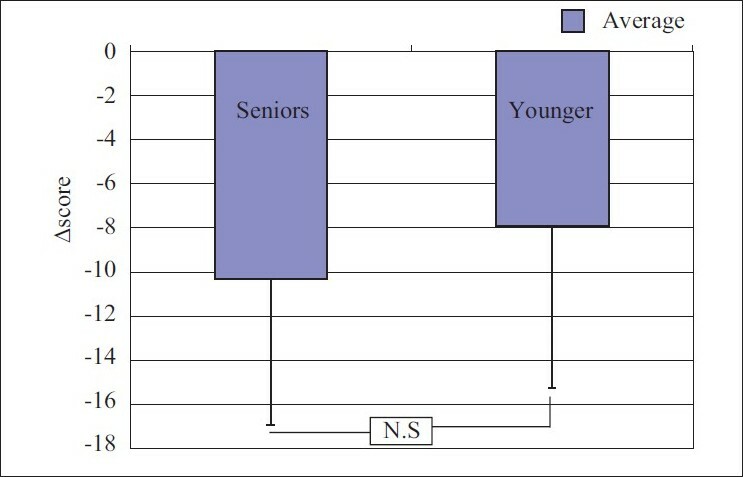 In seniors sAA level was higher; this may be due to stress or increased sympathetic activity or increased epinephrine levels compared to the young. In two senior subjects in the initial two to three classes the sAA increased after yoga, this might be due to pain after practicing asana or failure to relax during meditation or anxiety about yoga. However, after a few classes, once they got accustomed to yoga, sAA levels came down. Decreased sympathetic activity signifies a decrease in stress level. 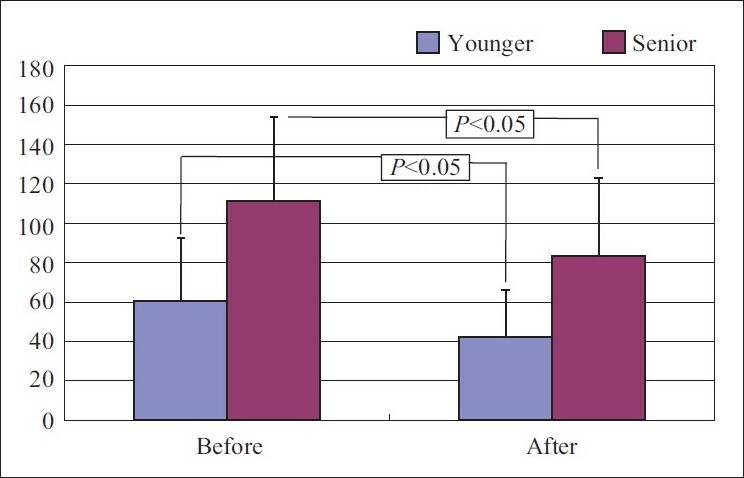 In young individuals the sAA level was low compared to seniors and it reduced after yoga practice. This signifies that yoga helps to improve mental health and to overcome routine stress. It is well documented that sympathetic adrenal activity increases during submaximal incremental exercise, especially once the anaerobic threshold has been reached. Studies have shown that the anaerobic threshold can be detected through analysis of exercise-induced changes in sAA levels. Changes in salivary amylase, blood lactate level, electromyographic response of working muscles and relation of sympathetic response to exercise was also studied. Previous studies have also shown that yoga-based guided relaxation reduces sympathetic activity. Even mentally repeating 'OM' showed reduction in sympathetic activity compared to a neutral word and non-targeted thinking. In this study subjects practiced relaxing asanas, pranayama and meditation. Reduction in sAA may be due to decreased sympathetic response. As sAA is an indicator of acute changes in the sympathetic activity this result show that yoga immediately reduces the sympathetic response or stress and relaxes the body and mind. Mechanism of action according to Yoga: Asana gives controlled stretch to the muscles and improves the flexibility. Relaxing asanas like shavasana help to relax the body and mind. Pranayama helps to gain control over the breathing. According to yoga, by controlling the prana one can control the mind. By practicing asana, flow of prana becomes normal and by practicing pranayama one can control the prana. Even pranayama like Bhramari has a soothing effect on the mind. Later, by practicing meditation one can easily concentrate and relax. Chanting 'OM' helps to control the mind from different unwanted thoughts. Lack of a control group may be considered as a limitation of this study but sufficient references about similar studies having control are provided so that the result of this study can be attributed to yoga. Yoga helps to improve the mental health of both the young and seniors by reducing stress. Yoga can be wisely applied in welfare programs to improve the Quality of Life in all age groups. 1. Health and welfare statistics association. J Health Welfare Stat 2009;56:39. 2. Cohen S, Kessler RC. Measuring stress. New York: Oxford University Press; 1997 p. 3-9. 3. Deshpande S, Nagendra HR, Nagarathna R. A randomized control trial of the effect of yoga on verbal aggressiveness in normal healthy volunteers. Int J Yoga 2008;1:76-82. 4. Selvamurthy W, Ray US, Hegde KS, Sharma RP. Physiological responses to cold in men after six months practice of yoga exercises. Int J Biometeorol 2005;32:188-93. 5. Usha Panjwani, Gupta HL, Singh SH, Selvamurthy W, Rai UC. Effect of sahaja yoga on stress management in patients of epilepsy, Indian J Physiol Pharmacol 1995;39:111-6. 6. Shannon M, Bennett, Weintraub A, Sat Bir S Khalsa. Initial evaluation of the life force yoga program as a therapeutic intervention for depression. Int J Yoga Ther 2009;18:49-57. 7. Oken BS, Zajdel D, Kishiyama S, Flegal K, Dehen C, Haas M, et al. Randomised controlled, six month trial of yoga in healthy seniors: Effects on congnition and quality of life. Altern Ther Health Med 2006;12:40-7. 8. Rohleder N, Nater UM, Wolf JM, Ehlert U, Kirschbaum C. Psychological stress induced activation of salivary alpha amylase. Ann N Y Acad Sci 2004;1032:258-63. 9. Yamaguchi M, Kanemori T, Kanemaru M, Mizuno Y, Yoshida H. Test strip type salivary amylase activity monitor and its evaluation. Sensors Materials 2003;15:283-94. 10. Spielberger CD. Manual for the state: Trait anxiety inventory. California: Consulting Psychologists Press; 1977. p. 1-2. 11. Rohleder N, Wolf JM, Maldonado EF, Kirschbaum C. The physiological stress induced increase in salivary alpha amylase, is independent of saliva flow rate. Psychophysiology 2006;43:645-52. 12. Rohleder, Nater N. Determinants of salivary alpha amylase in humans and methodological considerations, Psychoneuroendocrinology 2009;34:469-85. 13. Circharro JL, Legido JC, Alvarez J, Serratosa L, Bandres F, Gamella C. Saliva electrolytes as a useful tool for anaerobic threshold determination. Eur J Appl Physiol 1994;68:214-8. 14. Calvo F, Chicharro JL, Bandres F, Lucia A, Perez M, Alvarez J, et al. Anaerobic threshold determination with analysis of salivary amylase. Can J Appl Physiol 1997;22:553-61. 15. Chicharro JL, Pérez M, Carvajal A, Bandrés F, Lucía A. The salivary amylase, lactate and electromyographic response to exercise. Jpn J Physiol 1999;49:551-4. 16. Vempati RP, Telles S. Yoga based guided relaxation reduces sympathetic activity in subjects based on baseline levels. Psychol Rep 2002;90:487-94. 17. Telles S, Nagarathna R, Nagendra HR. Autonomic changes while mentally repeating two syllabus-one meaningful and the other neutral. Indian J Physiol Pharmacol 1998;42:57-63. 18. Spielberger CD. Manual for the state: Trait anxiety inventory. California: Consulting Psychologists Press; 1977. p. 2-4. 19. Khemka SS, Rao NH, Nagarathna R. Immediate effects of two relaxation techniques on healthy volunteers. Indian J Physiol Pharmacol 2009;53:67-72. 20. Shapiro D, Cook IA, Davydov DM, Ottaviani C, Leuchter AF, Abrams M. Yoga as a complementary treatment of depression: Effects of traits and moods on treatment outcome. Evid Based Complement Alternat Med 2007;4:493-502. 21. Swatmarama. commentary by Swami Muktibodhananda, Hatha Yoga Pradipika, Munger, India: Yoga Publications Trust; 1998; 3rd ed, 150.